Carbohydrates; Some good, some bad. Understanding carbohydrates is important for older people trying to attain optimum health. If you are over sixty, you are probably overweight. A recent study showed that 90% of men and 70% of women in the US are overweight. Extra weight becomes a real health problem as we age. Problems with heart disease, diabetes, high blood pressure and other chronic diseases all increase dramatically with increases in weight. This is obviously a dietary problem and carbohydrates seem to be the culprit. Two modern fad diets attempt to deal with this. The Atkins Diet proposes almost no consumption of any carbs and the South Beach Diet recommends avoiding the bad carbs. Dieting usually means calorie counting. When we consume more calories than are needed, the extra calories are stored primarily as fat--whether the calories come from fat, carbohydrates, or proteins. Carbs are organic compounds consisting of sugars, starches, celluloses, and gums that serve as a major energy source in our diets. Glucose is the form of sugar that can be used by the blood stream. Fructose, from fruit, and lactose, from dairy products are transformed to glucose to be used or stored. Starches too are changed to glucose. Glucose is stored in the liver and muscles. When the body has more glucose than it needs it is stored as fat. The logic of the Atkins diet seems to be 'if carbs are going to be stored as fat, don't eat them'. So how do you know which carbs are good and which are bad? DON'T EAT ANYTHING WHITE. That is an obvious oversimplification but here is what it means. Brown is good. White is bad. The white group consists of refined foods and the two main items are refined white flour and granulated sugar. White bread, white flour, white rice, grits, pasta, corn tortillas, pretzels, and crackers all fall into this group. Refined grains have been milled and stripped of most of their iron content, fiber , and B vitamins (thiamin, niacin, riboflavin, and folate). Fiber from cellulose is essential to good digestion. The brown group consists whole grains such as: whole wheat, whole oats, whole grain corn, brown rice, whole rye, whole grain barley, millet, bulgur, buckwheat, and sorghum. 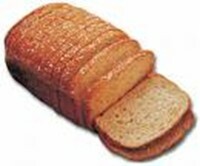 Read the labels to make sure your breads and cereals are whole grain. Pasta is also available from whole grain flower. All whole grain foods have natural fiber. All raw fruits are good. Even though they are simple carbs, they take longer to digest and are loaded with vitamins, mineral and fiber. If you did nothing more than remove anything made with white flour or white sugar from your diet you would probably not put on excess pounds.